The book is a personal account of my 35 years involvement in the design and construction of pole houses. It deals with the practical issues that confront designers and builders, and the philosophy behind what I believe to be good architectural practice. It offers a simple and wholistic approach to creating a dwelling. It is in the home that most of us make the most important decisions in our lives, so it is important that the home environment be nurturing and stimulating. There are biological relationships that occur at the cellular level between the myriad components of our physicality that trigger our sensual and emotional responses. Pole Frame Magic explores those relationships and applies the principles behind them to an architectural format that is within reach of us all. To properly comprehend our own nature, we need to have awareness of our relationship with everything around us, because it is our family, our friends and our environment that reflect back to us the things that teach us about ourselves and help us find inner peace and happiness. Building a home with expanded awareness of what we are doing can enhance our personal environment and bring many unexpected rewards. The book provides practical and technical information with particular emphasis on owner building. It includes several experiential accounts written by owner builders that bring the challenges and satisfactions of owner building into perspective. It comprises 181 pages, 178 mm x 228 mm (7" x 9"), with 60,595 words and numerous black and white photos and graphical images. 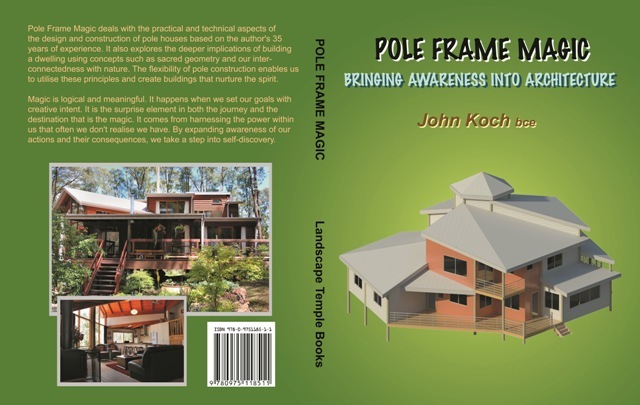 Pole frame Magic has been edited in 2013, and is now available with improved text and graphics and updated photos. To purchase, contact me at 21 Stanmore Avenue, Somers, Victoria, Australia.